In recent times much is being said about the “end times.” We have already published interesting articles by Father Seraphim Rose and other authors, clarifying many specific manifestations of modern life. You will find these articles in our online library, in the “Modern-day Life” and “Science and Religion” sections. Now we offer you two articles by spiritual authors on this subject, illuminating different aspects of it. The first article, containing the incredible prophecy of St. Nilus the Myrrh-streaming, summons us to vigilance and spiritual awareness in evaluating the apocalyptic world surrounding us. The second article stresses the bright prophecies concerning the renaissance of Russia that is due to take place right before the end of the world, and urges us to have hope of their fulfillment. “In the middle of the 20th century, the people of that time will become unrecognizable. When the time for the advent of the Antichrist approaches, people’s minds will grow dim from carnal passions, and iniquity and lawlessness will grow stronger. The world will then become unrecognizable. People’s appearance will change, and it will be impossible to distinguish men from women due to their shamelessness in dress and style of hair. These people will be cruel and will be like wild animals because of the temptations of the Antichrist. There will be no respect for parents and elders, and love will disappear. Christian pastors, bishops and priests, will become vain men, completely failing to distinguish the right-hand way from the left. At that time morals and traditions of Christians and the Church will change. People will abandon modesty and chastity, while fornication and dissipation will reign. Falsehood and love of money will reach extreme proportions, and woe to those who will pile up treasures. Fornication, adultery, homosexuality, secret deeds, theft, and murder will rule in society. At that future time, due to the power of such great criminality and licentiousness, people will be deprived of the grace of the Holy Spirit, which they received in Holy Baptism, and equally of remorse. The Churches of God will be deprived of God-fearing and pious pastors, and woe unto the Christians remaining in the world at that time, who will completely lose faith, because they will lack the opportunity of seeing the light of knowledge from anyone at all. Then they will separate themselves out of the world into holy refuges, seeking to assuage their spiritual sufferings, but everywhere they will encounter obstacles and constraints. And all this will result from the fact that the Antichrist will want to be master over everything and to become the ruler of the whole universe; he will produce miracles and fantastic signs. He will also give depraved wisdom to people, so that they will discover a way by which one man can carry on a conversation with another from one end of the earth to the other. At that time men will also fly through the air like birds and descend to the bottom of the sea like fish. And when they have achieved all this, these unhappy people will spend their lives in comfort without knowing, poor souls, that it is the deception of the Antichrist. And the impious one! – he will so perfect science with vanity, that it will lead people off the right path and cause them to lose faith in the existence of the One God in Three Hypostases. Can it possibly still be unclear to anyone, that before us we see in this astounding prophecy the clear and living picture of everything happening in the world now? Completely vain and totally unsubstantiated are the efforts of some, when they attempt to persuade us that “it was always like that” and that “there is nothing new in this.” Of course there has always been sin and lawlessness, but never before in the history of Christian mankind did all of this ever assume such monstrous proportions as in our current times; people have always sinned, but never before did they sin so brazenly, so visibly, openly, and insolently, without even a hint of repentance, as in our times. Now there is no longer anyone to counteract the coming of the Antichrist, and therefore it is quite natural to expect his coming and enthronement in the world which has completely become immersed in sin and iniquity. 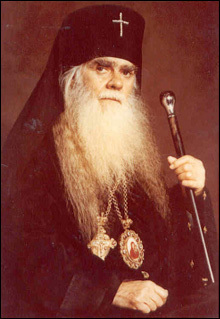 Not only is there no one to counteract the coming of the Antichrist, but even to the contrary, very many have now joined the most intense work in preparation for his imminent enthronement, not excluding (as horrifying as it is to say) certain Christian clergymen, even including top hierarchs of the Church, who are collaborating with the godless ones and the open and covert enemies of our Lord and Saviour, being involved in all sorts of negotiations with them, entering into various compromises and concluding all types of agreements which often border on betrayal of our holy faith and Church. The “apostasy” or “falling away” which the Word of God foretold through the Holy Apostle Paul (II Thess. 2) is currently in full swing, and woe unto the person who does not see this, or more precisely, does not wish to see, and because of unforgivable thoughtlessness people close their eyes to everything that is happening in the world, and pacifying themselves and others they say “there is nothing unusual,” that “all of this is normal and natural.” But we must not forget that the Antichrist and his servants are not at all interested in there being too much talk and open pronouncements about his coming and becoming ruler: for he will come in the capacity of a supreme benefactor of mankind, a benefactor and even protector of the faith and the Church, and he will expect overall recognition and the subordination of all nations. From the predictions of the holy fathers we know that not only will those who are total non-believers accept and submit to the Antichrist, but also seemingly the faithful and even Christian clergy, including those who hold the highest of office, will be beguiled by him. So can it be that the time for the appearance of the Antichrist has really come? We are not making this assertion. We speak only about the fact that the breathing of the spirit of the Antichrist is so clearly sensed in the world now, just as if his appearance is already “close and at the door,” as is the expression of Christ the Saviour Who gave us numerous signs of when the end is near. Also most importantly we wish to warn everyone against being beguiled by that spirit of Antichrist. To dismiss thoughts on the coming of the Antichrist is precisely in his interests, and this is very dangerous. Such a person is already halfway in his hands and of course will pay homage to him when he comes. But what should we make of the predictions on the resurrection of Russia still to come and the victory of Orthodoxy there and seemingly almost in the entire world? Of course all of us would very much wish to see our native land Russia resurrected to a new life and to participate in the universal victory of our holy faith. That goes without saying! But such an indescribable mercy from God must be earned. This will not happen just by chance. Furthermore, it is imperative to know that all prophecies are always conditional and not at all unconditional. For even Prophet Jonah was ordered by God Himself and predicted the fall and ruin of the great city of Nineveh, but this prediction did not come to pass: Nineveh was not destroyed; the Lord spared it because of the en masse repentance of its inhabitants, beginning with the king himself. We must view the contemporary state of the world as follows: God’s sword of chastisement has already been raised over the world, but it may still be set aside, if in the world there will be that “overall moral purification, a deep repentance of all nations, and the replacement of pagan morals by Christian ones,” toward which our marvelous pastor and wonderworker, the holy righteous St. John of Kronstadt exhorted the Russian people in his days, but alas in vain. “Without repentance there is no salvation.” This sacred truth is well-known by each genuine Christian; therefore, to hope for some kind of “extension” for the salvation and renaissance of Russia and the entire world without repentance is unjustified. The holy righteous John of Kronstadt said: “If the Russian people do not repent, the end of the world is near.” This is why we must all now be thinking primarily about repentance, putting everything else far off to the side – all of our vain cares, plans, and ideas. But is there such repentance in our contemporary world, such an overall turning to God by everyone, which alone is able to deflect the chastising hand of God away from mankind immersed in its plunging moral fall? For now this is not to be seen. Given the contemporary circumstances in which we are now living, the above prophecy of St. Nilus the Myrrh-streaming remains in full force, with all ensuing repercussions. “Watch therefore!”, Christ the Saviour commanded us, “for in such an hour as ye think not the Son of man cometh” (Matt. 24:44).